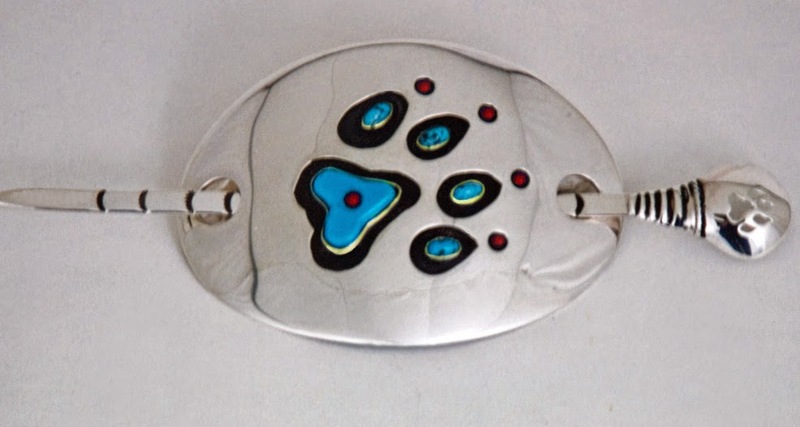 Welcome to part 1 of a new blog series titled "What's Your Doodem," in which we connect our storytelling art - in the form of rings, jewelry, and canvases - with the odoodeman (clans) of the Anishinaabe and Haudenosaunee Peoples of the northern regions of Turtle Island - nowadays called Canada and the United States. The focus in this blog post will be on the system of kinship and the origin of the clans of both Nations. We will learn that in Anishinaabe as well as in Haudenosaunee societies, the families, which have an extended nature, are organized into clans, or, in the case of the Anishinaabeg, into phratries (clan groups) that in turn are divided into clans and subclans; the purpose of these phratries and clans has always been to divide labor and spiritual-ceremonial tasks, provide general support, and to stress identity of self and the group. Gakina-awiiya (We Are All Related), acrylic painting by Simone McLeod. The Native Peoples of Turtle Island have always paid attention to the voices of the supernatural powers that dwell the four corners of the Universe; they have always listened to the voices of the Sun, the Moon, the stars, the rivers and lakes, the trees, plants and rock formations, and, in particular, to the voices of the animals, which are looked upon as the older and wiser relatives of mankind. Animals have always inhabited the world of our Native Peoples, which they often shared with them, and from time immemorial, animals intersect the People's paths in many ways. Animals are regarded as mysterious, ambiguous even; they visit individuals in dreams and songs and chants for instructions and directions and they hold up a mirror to show them where their individual and collective vices and strength lie. This is why throughout the ages many generations of artists and craftsmen and craftswomen have inscribed and painted countless stylized images of their animal relatives on rocks and cliff walls, on their garments and medicine bags, on copper and led slates and on drums, and in sacred teaching devices such as birch bark scrolls. Our ancestors listened very carefully to the animal relatives and paid careful attention to their ways because they believed that animals disclose certain norms and principles that they, as humans, needed for living long and healthy lives; and because they understood that animals represent the basic needs of human society, they chose them as emblems for their phrarties and clans. Thus, trough the clanship system founded by our ancestors, animals, even in our modern day and age, instill in clan members certain virtues to emulate and provide them with a set of life-long responsibilities to live up to - both individually and communally. An ancient oral tradition of the Ojibwe Peoples, depicted on birch bark scrolls and handed over by countless generations of MIDEWIWIN (Great Medicine Lodge) People, relates the origin of the clan groups of the Anishinaabe Peoples, to which belong, among others, the Niswii-mishkodewin or Confederation of Three Fires (consisting of the Ojibweg, the Odaawaag (Odawa), and the Bodéwadmik (Potawatomi); the Anishininiwag (Oji-Cree); Odishkwaagamiig (Nipissing); the Misizaagiwininiwag (Mississaugas); the Omàmiwininiwak (Algonquin); and the Mamaceqtaw (Menominee). The same Ojibwe tradition - which by the way is not taken for granted by other Anishinaabe Peoples such as the Mamaceqtaw, Anishininiwag, Odishkwaagamig, Misizaagiwininiwag, and Omàmiwininiwak, who maintain that they have been in their current location since time immemorial - relates that thousands of years ago when the Anishinaabeg were still living in Waabanaki or Dawn Land along the northern shores of the Atlantic Ocean, seven great beings emerged from the sea. These beings are called called Midemiigis-gaa-niigaani-gikendangig; prophets who had taken the form of Miigisag (Seashells). These prophets established a unique system of kinship based on five phratries or clan groups divided into several different odoodeman (clans or totems). Each Miigis Being represented an animal, a bird, a fish, a tree, or a Spirit Being. 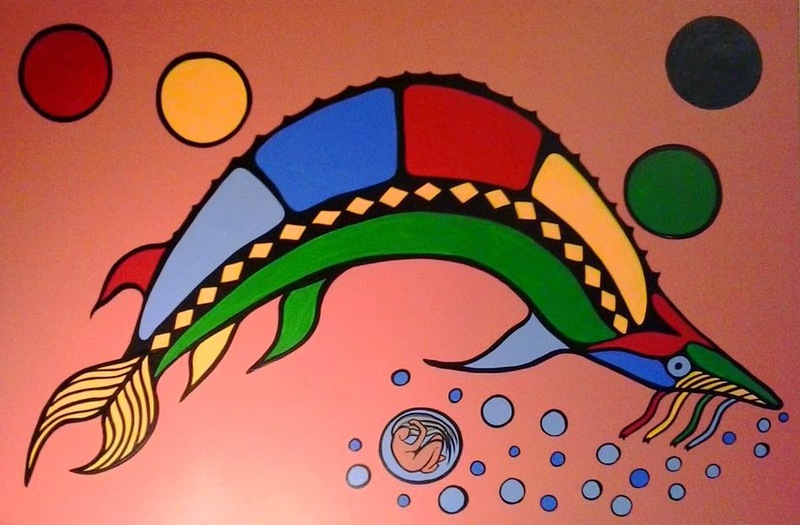 The Miigis Being who appeared first out of the sea was a fish called Wawaazisii (Bullhead); he would form the phratry whose clans would deliver the teachers, scholars, and healers of the Nation. Below is a list** of the odoodeman (clans and subclans) of the following Anishinaabe Nations: Anishiniwag (Oji-Cree), Ojibweg, Odaawaag, Bodéwadmik, Odishkwaamagiig (Nipissing), Misizaagiwininiwag (Mississaugas), and Omàmiwininiwak (Algonquin). The clans and sub clans, some 65 in total, are classified under headings denoting the five basic needs of the Anishinaabe Nations in question and the five elementary functions of their societies. The known Anishininiwag clans are marked with (An), Ojibweg clans with (Oj), Odaawaag clans with (Od), Bodéwadmik clans with (Bd), Misizaagiwininiwag clans with (Ms), Omàmiwininiwak clans with (Om), and Odishkwaagamiig clans with (Ok). Note that usually only a few, often no more than four or five, of the odoodeman listed below are found in each of the Anishinaabe communities. Also, note that the list is not (yet) complete and (still) might contain inaccuracies! For an extensive list based on a division of CLAN GROUPS (PHRATRIES) and their corresponding (sub)clans (partially) based on a classification by William W. Warren and in the process of being modified by Charles J. Lippert, see Wikipedia. N.B. : Some Ojibwe bands owe their name to the clan that used to play a significant role in their community. Throughout the ages, the Nation adopted and integrated several family groups or bands of related, Algonquin-speaking Peoples and their clan names with it. Some were captives and were forcibly folded into the Ojibwe identity; others would join out of free will, because they were being threatened or were seeking protection. Needless to say that this increase of population, which resulted into a considerable expansion of the original Ojibwe clan system, made the Nation stronger, economically, politically, and, in a way, spiritually…Well-known examples of culturally and linguistically related (historical) newcomers who are still verifiable by their doodem, are the Noquet (Nookezid or the Bearfoot Nation) who originally belonged to the Mamaquectaw (Menominee) People; the Nigigoueg (Nigigwag or the Otter Nation); the Amikwa (Amikwag or the Beaver Nation); the Marameg (Maanameg or Catfish Nation); and the Maanadwe (formerly a clan division of the Meshkwahkihaki). Over the years, many Odaawaa persons were adopted, and they, too, integrated their own odoodeman into the Ojibwe clan system. Among well-known Ojibwe clans that indicate non-Ojibwe origins are also: Ma'iingan-doodem (Wolf Clan), some of whose members are of Dakota descent, and Migizi-doodem (Bald Eagle Clan), which adopted many Anglo-Americans in the past. And as we saw earlier, among some Ojibwe communities, Waabizheshi (Marten clan) consists partly of descendants of the Maanadwe doodem (Fisher clan) of the Odagaamii Meshkwahkihaki, a sibling Anishinaabe Nation that once lived along the south shore of Gichigami (Lake Superior) in what is now Wisconsin and who were defeated in a fierce battle with the Ojibweg; throughout time, the Ojibwe Waabizheshi-doodem would also adapt many persons with a non-Native father and an Ojibwe mother. Also, Gichi-makwa (Grizzly bear) doodem contains adopted members of the Hohe Nakoda (Assiniboine) Nation, and the Gekek-doodem (Hawk Clan) consists of descendants of the Numakiki (Mandan). 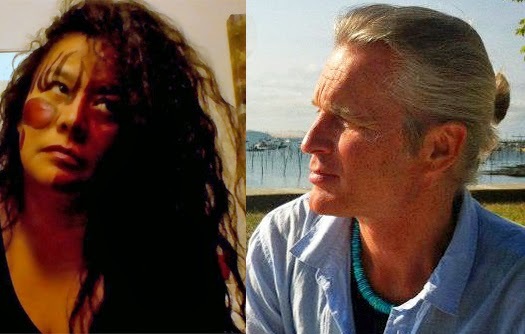 Finally, it should be noted that some odoodeman are considered rare today among the Ojibweg because they have in a certain point of history migrated into other Nations, such as the Nibiinaabe-doodem (Merman Clan), which shows up as the Water-spirits Clan of the Ho-Chungra (Ho-Chunk, Winnebago). > Nooke, the Bear clan group, at one time used to be so numerous that is was subdivided into body parts; nowadays these sub-clans are one single clan. Nooke doodem members, besides defenders who patrol the woods around the community to watch for danger, are also looked upon as medics and as respected guardians of Anishinaabe traditions; many decision makers and legal specialists have also emerged from the ranks of the Bear Clan. > Adik, the Caribou clan, is common among the Ojibweg and Anishininiwag (Oji-Cree) north of Gichigami (Lake Superior). A prominent family from this doodem from Gichi-onigamiing (the Grand Portage area, MN) relocated to Mooningwane-kaaning-minis (La Pointe, WI) and produced the chiefs Mamaangĕzide and Waabojiig. Later members of this branch became leaders at Baawitigong (Sault Ste. Marie, MI). Below is a list** of the 34 clans of the Mamaceqtaw Anishinaabeg (Menominee), classified under four headings denoting the five needs of the Mamaceqtaw People and the five elementary functions of their society. As a rule, the members of the Haudenosaunee Six Nations are related through their mothers. Their clans are named after animals. Among the Anishinaabeg, clans consist of a group of people related through the father to a distant progenitor - an animal or a tree or Spirit Being from the lakes or the sky... all siblings belonging to the same family share with the father the rituals and social and ceremonial-spiritual duties of clanhood, as well as certain ritual objects such as medicine bundles, colors of facial paint, songs and chants, food taboos, and other devices that distinguish them from other clans. Patrilineal kinship among the Anishinaabeg was possibly based on the need for the close cooperation of males in hunting; one could also imagine that the aggressive patriarchal religious system of the European invaders had a certain influence on the Anishinaabe kinship system. It is therefore very plausible that in pre-contact times, the Anishinaabeg, like the Haudenosaunee Nations which used to live in the same area, had a matrilineal society - which means their doodem identity would have been passed through the mother. In the old days, although nowadays of less importance and in many cases merely symbolical - but nevertheless remainig an imortant part of "tribal" identity -, Haudenosaunee and Anishinaabe clans used to be extremely instrumental in traditional occupations, inter-tribal relations, and marriages. They played an essential role in warfare, diplomacy, and in maintaining law and order. Doodem identity stood at the base of the division of labor, teaching, healing, defense, and leadership/communications. The clan to which an individual belonged determined his/her place and role within his/her community. Kinship, and the clansystem that reflected it, was at the heart of all social relationships. Literally all social - and, in some cases, political - interaction was conditioned by kinship. Clans used to be the number 1 binding factor; "tribal" labels held little or no meaning. Individuals regarded themselves as members of a doodem first, then a(n) (immediate) family, and then a community. This was especially true for the Anishinaabeg; it should be noted that between them and the Haudenosaunee, although both Nations were organized through clanship, existed different principles when it came to tracing descent and to organizing social/ceremonial and political life. 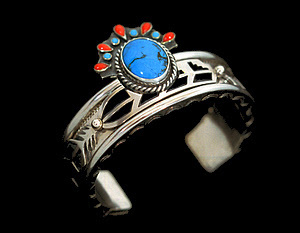 MIKINAAKOMINIS (Turtle Island), sterling silver and gold hair buckle by Zhaawano. For details, see our Fisher Star Creations website. Although nowadays many individuals have lost track of their doodem membership, we see lately a revival of the traditional knowledge, especially among the younger generations, as a way to honor one's ancestors and family and tribal identity, and to find a sense of purpose and direction in life and society - in their own communities as well as in American or Canadian society. The clans of the Haudenosaunee Nation, or People of the Longhouse - which nowadays consists of the subnations of Onondowahgah (Seneca), Guyohkohnyoh (Cayuga), Onoñda'gega' (Onondaga), Onayotekaono (Oneida), Kanienkehaka (Mohawk), and Ska-Ruh-Reh (Tuscarora) -, were developed at a time in history when there were not as many people as there are today. It was a time when there was much uncertainty as to who was related to whom. The elders, who were worried about the harmful effects of sexual relations between closely related family members, began to hold meetings about this delicate subject and about how it was going to be addressed. An old legacy of the Anishinaabeg of Upper Michigan tells of a prodigious tale of the legendary emergence, 700 summers ago, of five Mystery Beings from the waves of Mishigami, or Lake Michigan. The teachings of these enigmatic newcomers resulted in a new doodem framework shaping Anishinaabe society in Michigan, and were ultimately (probably in 796 AD) followed by the historical alliance called Niswi-mishkodewin (Council of Three Fires), formed by three large southeastern bands that had emerged from the nation of the Anishinaabeg: the Ojibweg, the Odaawaag, and the Bodéwadmik. coral bracelet by Anishinaabe Clan Jewelry Design. The Ojibwe legacy of the Five Mystery Beings was handed over as follows: a long time ago, after the five mysterious creatures had waded ashore, they taught the People of Michigan how they could formalize and extend a vast net of kinship. Hereupon the Ojibweg began to form five groups of patrilineal kin whose members thought of themselves as descendants of an ancient animal ancestor. Although these members were scattered throughout the entire Great Lakes area and many would remain unknown to each other personally, they were all part of the same odoodem, or totemic clan. 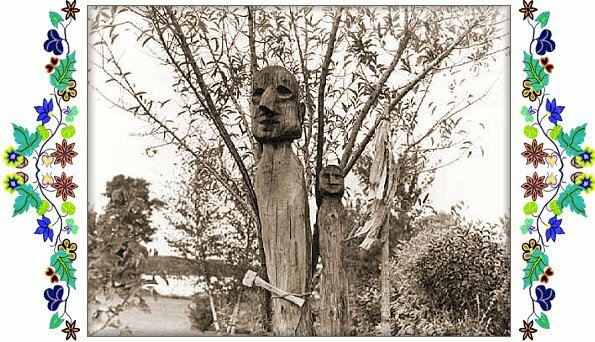 All five totems were represented by Awesiiyag (Animal Beings) ever since, because animals appeared to live in harmony with the laws of the world, and thus proved themselves the older, wiser brothers of the human beings. Eventually, these original gidoodeminaaning, or our animal totems (Ajijaak the Crane; Makwa the Bear; Moozonii the Little Moose/Waabizheshi the Marten; Maanameg the Catfish; and Maang the Loon) gave rise to twenty or more totems; each associated with these original five. AJIJAAK BIMISEWIN (Flight of the Crane) overlay bolo tie by Anishinaabe Clan Rings design: oval 14K white gold slide backed by a sterling silver plate; sterling silver bolo clasp; turquoise stone in shadowbox setting, braided black leather bolo cord with 14k. white gold tips. The bolo slide measures 55 x 45 mm (2.17 x 1.77 inches). Click here to view details of the bolo tie. 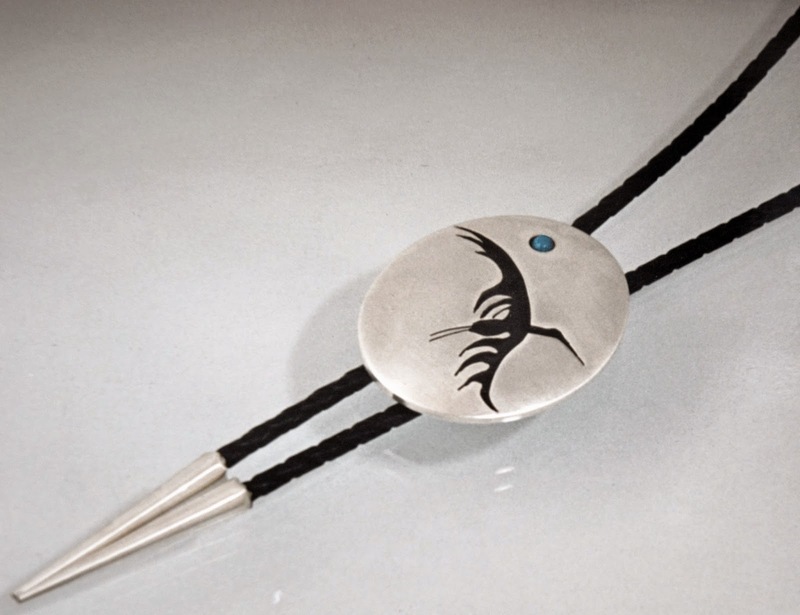 The stylized image of a flying crane on the above bolo tie allegorizes the origin of Baawiting (Boweting, Sault Ste. Marie), the legendary gathering place for the five major totemic clans of the southeastern Ojibwe Anishinaabeg. Being the descendants of Zhaawano's ancestors, these people – whose official name is now The Sault Ste. Marie Tribe of Chippewa Indians – still live in the region of what is nowadays called Upper Michigan State. "Many moons ago, GICHI-MANIDOO sent Ajijaak (a sandhill crane) to earth on a mission. While the spirit-bird was descending, he uttered loud and far sounding cries heard by ininiwag (humans) and manidoog (spirits) alike. Some say the cries must even have startled Makadeshigan, the spirit of the Underworld! Slowly circling down above Gichigamiin, the Great Fresh Water Lakes, sending forth his echoing cry, pleased with the numerous whitefish that glanced and swam in the clear waters and sparkling foam of the rapids, crane finally chose a resting place (known as the fifth stopping place) on a hill overlooking beautiful Baawiting. Again the crane sent forth his solitary cry and the clans of Maang (loon), Moozoonii-Waabizhesh (combined clans of little moose and marten), Awaazisii (catfish), and Makwa (bear) gathered at his call. They soon congregated a large town near the Rapids and a Ceremonial Lodge of the Midewiwin (Grand Medicine Society) was erected there, and for the second time since the People had left the Dawn Land the sound of the Midewiwin Grandfather Drum reverberated across the land and the waters. Since then the crane, who is sometimes called Baswenaazhi (the Echo Maker) and regarded as a symbol of eloquence and leadership, presides over all councils." 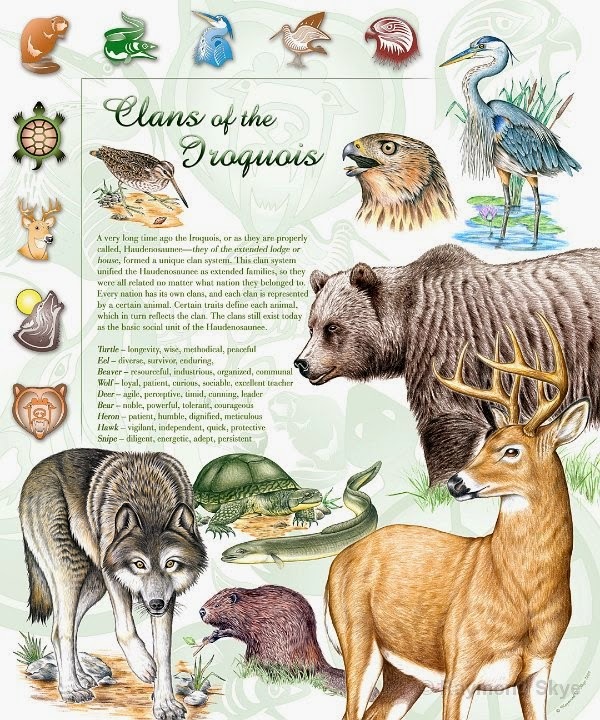 The five original clans of the descendants of the Baawitigowinini Ojibweg - Zhaawano's Anishinaabe ancestors who gathered at the call of the Crane at baawiting, the rapids and waterfalls of Michigan's Upper Peninsula -, hold a set of traditional responsibilities for the People. As is the case among all other Anishinaabe and Haudenosaunee Peoples, each doodem member regards himself or herself as member of a clan first, then a community. As a rule,, doodem membership includes certain colors, songs, and ceremonies, along with responsibilities that belong to the doodem in question. Binesi, the big Bird, headed by Ajijaak, the Crane, also called Baswenaazhi, the EchoMaker,is responsible for leadership and external communication because of his loud and clear voice. Members of the Crane clan are traditionally noted for giving direction and for their oratory skills. The Waabajijaak or White Crane clan provided for the traditional hereditary chiefs, and some of the more powerful chiefs of the Waabitigowininiwag met the first French explorers of Lake Superior. Bineshiinh, or Small Bird, headed by the Maang, or Loon, is a skillful fisher known for his loud, wild cry, and his habit of assuming his role of subchief, sometimes executive-chief-of-birds, with pomp and authority, definitely didn't make him very popular with the rest of the birds. Loon believes that, since nature placed a collar around his neck resembling the sacred miigis shells and also provided him with an eye-dazzling miigisiyesimiigan (wampum breastplate), he is entitled to a leading place in council. However, this badge of honor is being openly denied by the Crane. Nevertheless, the forefathers of the present-day Anishinaabeg became very fond of him! Members of the Loon Clan are usually responsible for leadership and internal communications; in the past, loon clan members often acted as subchiefs, in conjunction with the ogimaag (chiefs) of the Crane clan. Loon clan members are often charged with the community's council fires and help facilitate dialogue on all internal and/or domestic issues. By working together and regularly checking on each other, Maang doodem and Ajijaak doodem gave the Ojibweg a balanced government. Onasidan (Hoofs) / Waanakozidensan (Little Paws). A prominent member is the Waabizheshi, the Marten, the progenitor of Zhaawano's ancestors. Marten clan members are looked upon as OGICHIDAAG: warrior clan people inclined to be great strategic logistic thinkers and defenders of MINO BIMAADIZiWIN, the Good Way of the Heart (Midewiwin) and of ANISHINAABEMOWIN, the beautiful language of the Ojibwe people. Their colors are yellow, light brown and gold. In the old days, members of the Marten clan were master strategists in planning the defense of their people and they often served as pipe bearers and message carriers for the ogimaag (leaders). Waabizheshi fights for change and today he defends those who commit themselves to the cultural and educative values and the survival of the language, science and art of the Anishinaabe People. On a personal level, a Marten helps others to reach their potential. Giigoonh, or Fish, headed by the Awaazisii, the Bullhead, represents science and its members represent the duty of teaching and the virtues of patience and generosity. 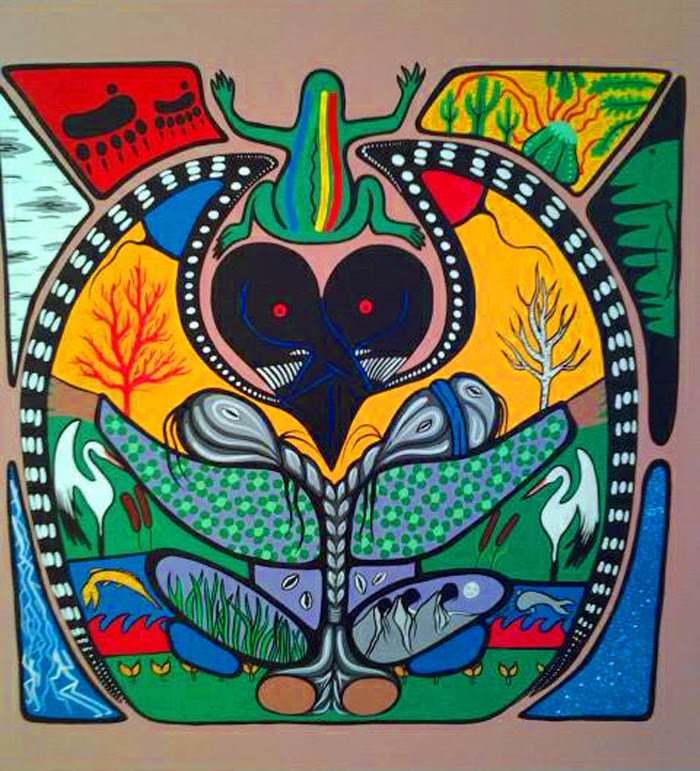 Maanameg or Catfish, representing one of the five odoodeman that gathered at Baawitigong, is known for producing the intellectuals of the People. Traditionally, Maanameg People are noted for their ability to combine two forms of training: imparting skills and knowledge, and passing on wisdom to the young. It was especially the Elders' task to teach about life through storytelling, chants, and dances, and to prepare the young for a vision quest. Fish clan members are also known to draw on their knowledge to solve disputes between the leaders of the Crane and Loon Clans. Traditionally fish clan people are known for long life and baldness in old age. Mang-waanakozidan, or Large Paws, was headed by the Makwa, the Bear, who was selected for his fierceness and bravery and is therefore in charge of defense. They are the police force and the medics of their Nation. Bear clan members have always served and protected their communities and since they traditionally spend much time outdoors they have great knowledge of medicinal plants and herbs used for treating minor diseases and infections. Traditionally, bear clan members are known for their thick black hair that never whitens even in old age. 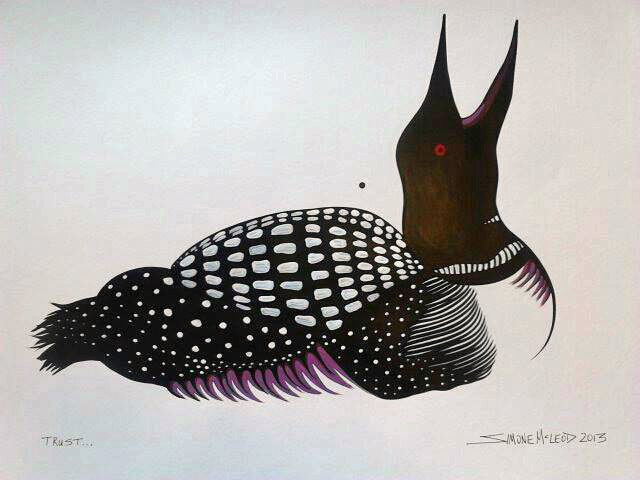 Apenimowin (Trust) - an acrylic painting by Simone Mcleod (2013), part of a Loon series belonging to a private collection. ©2013 Simone McLeod. "The Great Mystery once made a a bird, a great Sandhill Crane, and it sent the bird from the Skies to make its abode on Earth. After the spirit bird had shown the People where to establish a new settlement at the the rapids of Baawiting (Sault Ste. Marie), he presided over the odoodeman (totemic clans) of loon, bear, catfish, and the marten and little-moose odoodem." "Once again the bird took flight and it flew slowly over the waters of Gichigami. Pleased with the sand point of Zhaagawaamikong (Chequamegon Bay, Wisconsin), it circled over it, and viewed the numerous fish as they swam about in the clear depths of the Great Lake." "The great spirit bird then lit on Zhaagawaamikong, and from there again it uttered its solitary cry. A voice came from the calm bosom of the lake in answer. Baswenaazhi, pleased with the musical sound of of the voice, again sent forth its cry, and the answering bird made its appearance in the wampum-breasted Maang (loon). The bird spoke to it in a gentle tone, "Is it you who gives answer to my cry?" The loon answered "It is I." The crane then said to him, "Your voice is music. It is melody. It sounds sweet to my ear. From now on I appoint you to answer my voice in council." Although, as we mentioned earlier, some traditional sources state that farther back in history the Ojibwe Anishinaabeg were matrilineal – which means that doodem identity was passed through the mother – , nowadays the children usually become automatically members of the father's clan. Members of the same matrilineal or patrilineal clan, no matter how many miles apart, are kin and forbidden to marry, and are expected always to extend hospitality, food and lodging to each other. That tradition is carried on today. Tradition dictates that when members are buried, their odoodemimazininii (clan symbols) appear on their graves to mark their lineage. Also, clan symbols appear in birch bark scrolls of the Midewiwin and in the old treaty documents. Giiwenh. That´s how far this blog story goes. Miigwech for reading and listening! * Source: Basil Johnston, Ojibway Heritage Bison Book 1990, University of Nebraska Press, p. 61. ** Sources: Basil Johnston, Ojibway Heritage Bison Book 1990, University of Nebraska Press, p. 60, The Menominee Clan Story website, and Wikipedia. ****Source: William Warren, History of the Ojibway People (1855). *****Source:Charles E. Cleland, Rites Of Conquest the University of Michigan, 1992. A big miigwech goes to Charles L. Lippert, whose opinions and advice have been of invaluable help in the process of writing this blog story. Simone McLeod (her traditional name is Aki’-egwaniizid, which is an Ojibwe name meaning "Earth Blanket") is a Nakawe-Anishinaabe (Saulteaux) painter and poet, born in Winnipeg, Manitoba in 1962. She belongs to he Name doodem (Sturgeon clan) ad is a member of Pasqua First Nation in Saskatchewan. Simone feels a special kinship with her mother's people, the Azaadiwi-ziibi Nitam-Anishinaabeg (Poplar River "#16" First Nation) of Manitoba. She descends from a long line of Midewiwin seers and healers and artists. Her artwork has been appreciated by several art collectors and educational and health care institutions from Canada, as well as by art lovers from all over the world. Zhaawano Giizhik, an American currently living in the Netherlands, was born in 1959 in North Carolina, USA. Zhaawano has Anishinaabe blood running through his veins; the doodem of his ancestors from Baawiting (Sault Ste. Marie, Upper Michigan) is Waabizheshi, Marten. As an artist, a writer, and a designer of Native American jewelry and wedding rings, Zhaawano draws on the oral and pictorial traditions of his ancestors. In doing so he sometimes works together with kindred artists. He has done several art projects with Simone and hopes to continue to do so in the future. Really beautiful work, thank you for sharing all. Miigwech ge-giin, thank you too Sidonia!